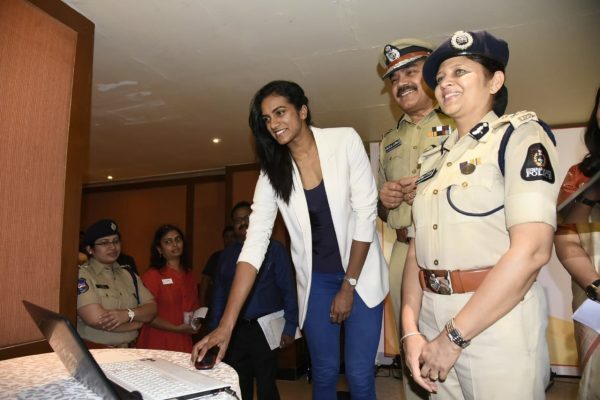 Badminton player PV Sindhu launching the programme with City Police Commissioner Anjani Kumar and Additional Commissioner of Police Shikha Goel. 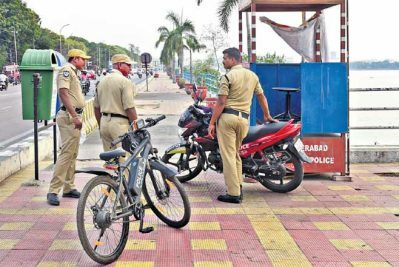 Hyderabad: Hyderabad has been named by several surveys over the last three years as the safest city in the country because women here are safe, according to City Police Commissioner Anjani Kumar. Nobody could claim a city to be safe if its women were not safe, he said. Kumar was speaking at the inaugural event of ‘SH(OUT) – Sexual Harassment Out: We are listening’, a first-of-its-kind initiative by the SHE teams, Hyderabad. The event was organised in association with Soroptimist International Hyderabad to discuss the provisions of the Sexual Harassment of Women at Workplace (Prevention, Prohibition, and Redressal) Act, 2013 here on Friday. The Police Commissioner said the initiative aimed to spread awareness among working women acorss sectors on what amounts to sexual harassment and what measures should be taken for its prevention. It would take this initiative to the grassroots level through a series of programmes in the next two years. “In many cases we notice that the suspect involved in sexual harassment is fired or shifted to other company. This is not a solution. He can victimise others elsewhere. We need to share details with companies about the accused person for them to be vigilant,” he said. 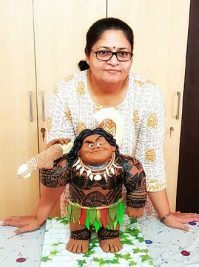 Kumar said as per statistics, women were less victimised in crowded places, adding that he represented a force, which has only about 2 per cent women and extremely less number of harassment cases. Shikha Goel, Additional Commissioner of Police — Crimes and SIT, Hyderabad, said the first interactive symposium was for influencers and key decision-makers who, in turn, would be able to implement this at their workplaces. They include CEOs, COOs, HR heads in corporate houses and representatives of different sectors, including educational institutions, hospitals, hospitality, sports and media. The participants represented a diverse group including TCS, Infosys, Cyient, ADP, Cognizant, Uber, Apollo Hospitals, Amazon, KIMS, Mariott Hotels, Novartis, L&T Metro, Ramoji Films, Osmania University and Telugu Film Chamber of Commerce. Various provisions of the Act were explained to the delegates with specific inputs on role and responsibilities of the organisation; constitution and functions of Internal Complaints Committee; and reporting and redressal mechanism for women employees.